CAMBRIDGE, Mass. — It has been 50 years since two scientists found landmark evidence for the Big Bang theory. Robert Wilson and Arno Penzias were using a large horn antenna at Bell Labs in New Jersey to gaze into the Milky Way. What they found, however, let them peer back 378,000 years after the Big Bang. The two scientists eventually found a cosmic fog that permeates the universe in every direction. Called the cosmic microwave background, it is a signature of the Big Bang that formed just after the universe began 13.8 billion years ago. When Wilson and Penzias started using the horn antenna, it registered higher-than-expected temperatures. At first, they thought pigeon droppings on the inside of the antenna caused the anomaly. Wilson and Penzias cleaned out the antenna and sent the pigeons to a bird fancier, who released them. The pigeons then came back and started nesting inside the instrument again, and eventually, the birds were shot to keep them from continuing to nest in the antenna. After ruling out pigeon poop as a possible cause for the higher-than-expected temperature, Wilson and Penzias landed on their landmark theory that the cosmic microwave background radiation, a remnant of the Big Bang, was actually causing the higher readings. Wilson and Penzias never had the "Aha!" moment that many scientists experience when making a huge discovery, Wilson said. At first, they didn't take cosmology seriously because it hadn't produced any solid scientific results up to that point. But after meeting with other scientists, Penzias and Wilson were won over by the idea of the Big Bang. "There was no 'aha' moment with this discovery. There was a long period of trying to get to the bottom of our problem," Wilson said here at the Harvard Smithsonian Center for Astrophysics on Feb. 20. "The importance of the discovery really only became clear over time. It became clear as theory was developed and as receivers got better so that one could look farther into the background and see something more than just a completely featureless picture." "My expectation is that this would be primitive life," Loeb said. The term "Big Bang" doesn't always refer to the same time in the history of the universe. Many scientists think that the Big Bang references the violent beginning of the universe and everything in it; however, the term is more complicated than that, said MIT theoretical physicist Alan Guth. 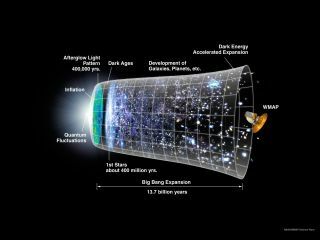 The term "Big Bang" "is a bit vague," Guth said. "People use it in all different ways," he added. "Some people use 'Big Bang' to mean the ultimate origin of the universe, whatever that was. That would have to come before inflation. I usually think of inflation as the precursor of the Big Bang, defining Big Bang as the period of enormous expansion that we study." Because the universe seems to be expanding at an increasing rate, eventually, observers will not be able to see any other galaxies from Earth or any other spot in the Milky Way. Galaxies are moving away from one another, and the galaxies that are farther away look like they are moving more quickly than ones that are closer. "We will see distant galaxies moving away from us, but their speed is increasing with time," Loeb said. "So, if you wait long enough, eventually, a distant galaxy will reach the speed of light. What that means is that even light won't be able to bridge the gap that's being opened between that galaxy and us. There's no way for extraterrestrials on that galaxy to communicate with us, to send any signals that will reach us, once their galaxy is moving faster than light relative to us." At some point in the distant future, every galaxy will be farther than what observers can see from Earth. Each galaxy will pass the visible horizon, making it impossible for scientists to observe them. "That's an outcome of the accelerated expansion of the universe," Loeb said. "All the galaxies that we currently see will eventually run away from us at a speed greater than the speed of light, and we won't be able to see their whereabouts after this time."